Meet Peter. He’s your ideal customer. He also happens to be the CMO of an early-stage company that just closed its first round of funding. Poised for employee headcount growth, he’s looking for a new productivity tool for his ever-growing team. Good news! He’s seriously considering your product. The bad news? With your behavior-based lead scoring system, Peter is going to slip through the cracks. After watching one of your webinars, he’s awarded 20 points—5 short of the threshold for him to be considered a marketing qualified lead (MQL). Peter is finally awarded those additional 5 points several months later, when he gets a random marketing email and happens to click on it. He’s immediately passed off to sales, but at that point, he’s already bought your competitor’s product. Lead scoring is supposed to construct a story out of data. But Peter’s behavior only tells part of his story. The result? Teams pass on ideal prospects and customers without even knowing it. Avoiding this outcome isn’t optional. For any company that wants to maximize the productivity of their sales efforts, it’s imperative you paint a clearer picture of your MQLs. 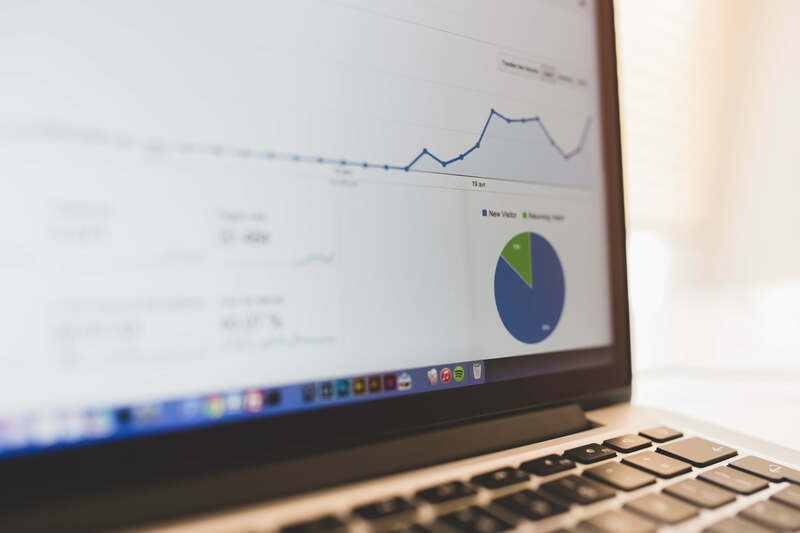 Lead scoring is still one of the most powerful ways to do that, but only if you incorporate more than just behavioral data. The principle behind lead scoring is simple enough. More positive activity = greater likelihood they’ll purchase your product. 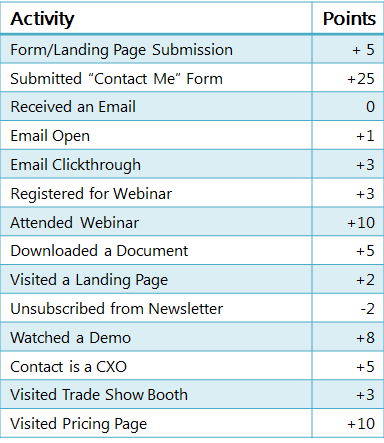 For example, this sample lead scoring sheet awards or detracts points for 13 kinds of lead behaviors. If they unsubscribed from your newsletter, they’re not interested. If they watched a demo, they’re interested. If they took the time to submit a contact form, they’re really interested. 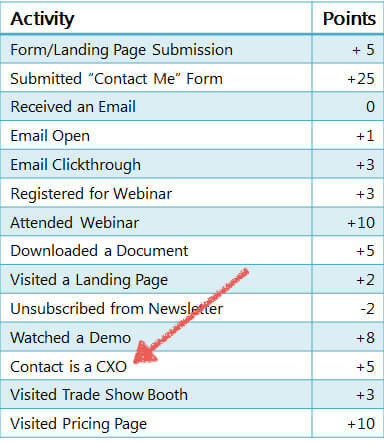 While this is a classic way of lead scoring, it’s really ineffective because behavioral data doesn’t tell the whole story. First problem? You have almost infinite behaviors to score. Depending on what kind of marketing collateral you use, you’ll wind up picking random behaviors to take into account that may not actually reveal how ready someone is to buy. For example, one Marketo guide to lead scoring lists a dizzying 200+ behavior-based scores to start off with. Yikes! It’s hard to know where to begin, or what each behavior should be worth in terms of points. What’s more, behavior-based lead scoring takes forever. Waiting for this data to trickle in can take months. If a prospect took ANY “positive” action at least once every 2 months and 29 days, his or her lead score would continue to climb indefinitely, especially if you have this many behaviors to track. As you twiddle your thumbs waiting for data to trickle in, the behavioral data becomes less and less relevant. In fact, it decays in how much it correlates to buying behavior by 25 to 30% per year. Pop quiz: go back to that sample lead scoring card that lists behaviors and how many points they’re worth. Find the one behavior that’s an outlier. The fact that this person is a CXO isn’t a behavior that implies something—it’s an objective fact. The rest of these “activities” are based on behaviors that people take, and marketers make assumptions from there. You assume that if they visited the pricing page, it’s because they’re interested in buying. You assume that because they opened an email, they’re intrigued. Your marketing team isn’t blindly constructing a story about who this person is. They can confidently hand off the contact to sales and say this person is a CXO, and they hold power within their company. With company data on Peter—the CMO who watched your webinar, remember him?—your marketing team might have seen that he was a C-level employee at a fast-growing company who, by watching your webinar, might be interested in your product. They would know to give him a higher score, pass the lead to sales, and close the deal before the window shuts forever. Like with any lead scoring technique, combining company and behavioral data is an iterative process, and you’ll need to play around to determine how to score each data point by how much it correlates with buying behavior. But in the end, you’ll want to have both elements factored into your process. It used to be that demographic data took a long time to compile. A BrightTalk survey found that one of the major impediments to getting higher lead quality was, “Lack of resources such as staff, funding and time.” That research is really important, but it’s costly. But now, smart data tools automate that process, allowing your team to get demographic and company data instantly. Unlike behavioral data that slowly drips in, it’s in your hands whenever you need it. Your sales team should certainly focus on the highest priority, highest quality leads. But lead scoring isn’t just cherry picking the best possible leads. Leads that are a good demographic fit but not interested yet might just need more nurturing. Instead of passing these leads off to sales, marketing departments can double down on them. As soon as they show some interest, they can pass the MQL off to sales, confident that the lead scoring system tells a more complete story about the lead, one that indicates both interest and fit. Our current system of lead scoring is failing, but it’s not dead in the water—you just need better information.